Chakkulathukavu Pongala is a world famous festival celebrated annually at the Chakkulathukavu Devi Temple, Neerattupuram, Thiruvalla. The temple is situated in the border of Pathanamthitta and Alappuzha Districts. On Pongala day,the largest gathering of women devotees in the world in a single place on a single day irrespective of caste or religion to offer pongala ( special naivedya )to Chakkulathamma. 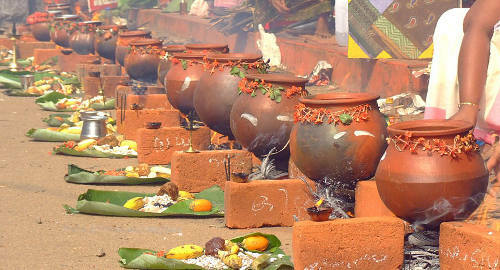 Every year pongala festival takes place on Karthika day of Malayalam month Vrischikam ( November/December ). 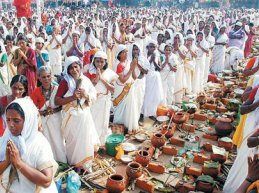 On Pongala day, millions of women devotees gather around the temple to offer Pongala to Chakkulathamma. The world famous Chakkulathukavu Pongala is on December 10th, 2019. 12 Km westward from the town of Thiruvalla in Neerattupuram Junction.